Last week I spent a full day on the couch due to a wicked case of the tummy aches. Ironically, the Food Network has never appealed to me more. I watched a full day of cooking shows and was actually quite inspired (Little known fact about me: I’m not a fan of cooking shows… I find them quite boring. Give me Kardashians any day.). Anyway. This soup looked flavorful, easy, and perfect for dinner on a day like yesterday where it finally felt like winter in New York (oh hello there snot-freezing winds, how I’ve missed you). I grilled up some fresh bread and cheddar for grilled cheese and voila: dinner. In a large stockpot, heat the vegetable oil over medium heat. Cook onion for around 5 minutes, or just until the onion starts to cook but before it turns translucent. Let cool for at least 5 minutes. In a medium sized bowl, combine (by hand) the onion, ground beef, cayenne pepper, garlic powder, rice*, salt, and cilantro until completely combined. Roll into 1-inch balls, wetting your hands with a little water if the ingredients start to stick to your fingers. The mixture should make around 25 meatballs. In the same large stockpot you cooked the onions in, add vegetable stock, tomato paste, potato, oregano, and cayenne pepper. Bring to a boil. 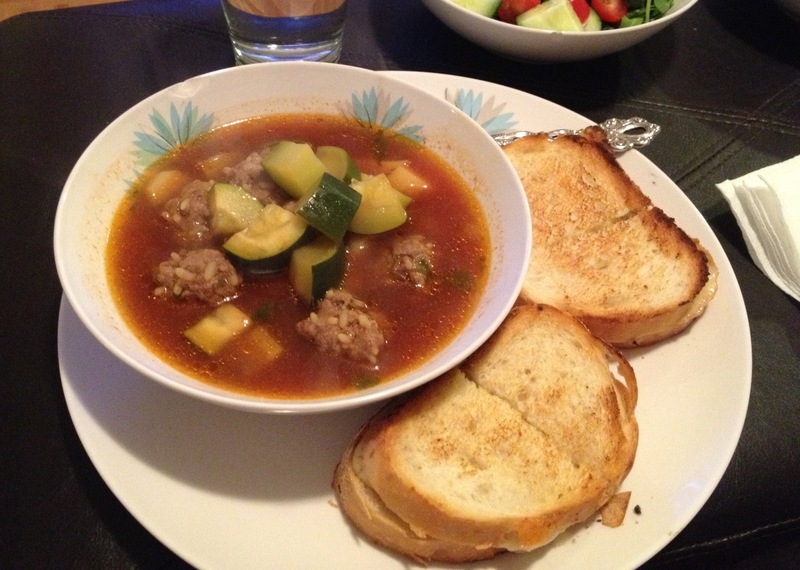 Once boiling, add the meatballs, zucchini, and parsnip. Reduce to a simmer and let cook for around 20 minutes or until the meatballs are cooked through. Add salt and pepper as needed. *Note: I know what you’re thinking, raw rice in the meatballs? But it does cook through completely and it is delicious! Promise. This dinner seems like a no-brainer but I needed to see it on another blog to make me think, “Oh yeah… that’s different!” It is so easy, relatively cheap, and takes all of 15 minutes to prepare. You’re welcome. Heat olive oil over medium heat in a large frying pan until the oil shimmers. 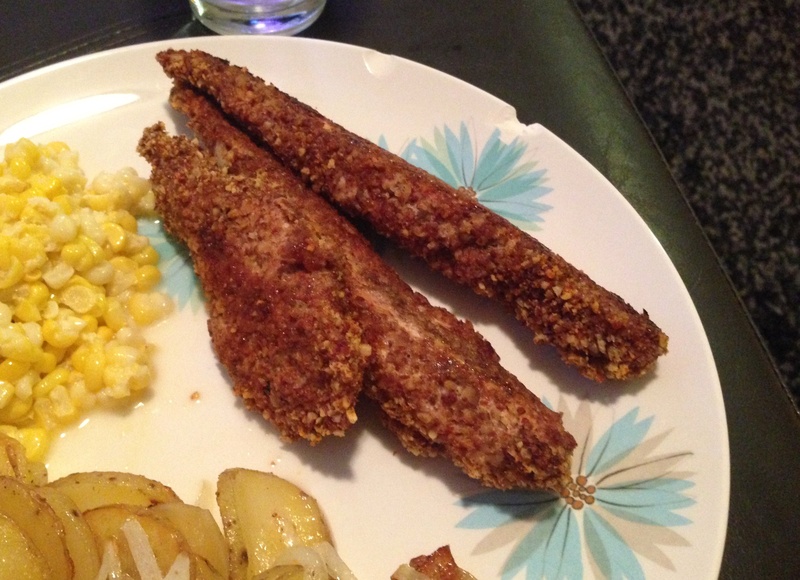 Cook steak on each side for 4 – 5 minutes. Once cooked, move steak off the heat and cover with a foil tent. Let meat rest for at least 15 minutes. Slice steak with a sharp knife into slices, cutting against the grain of the meat. 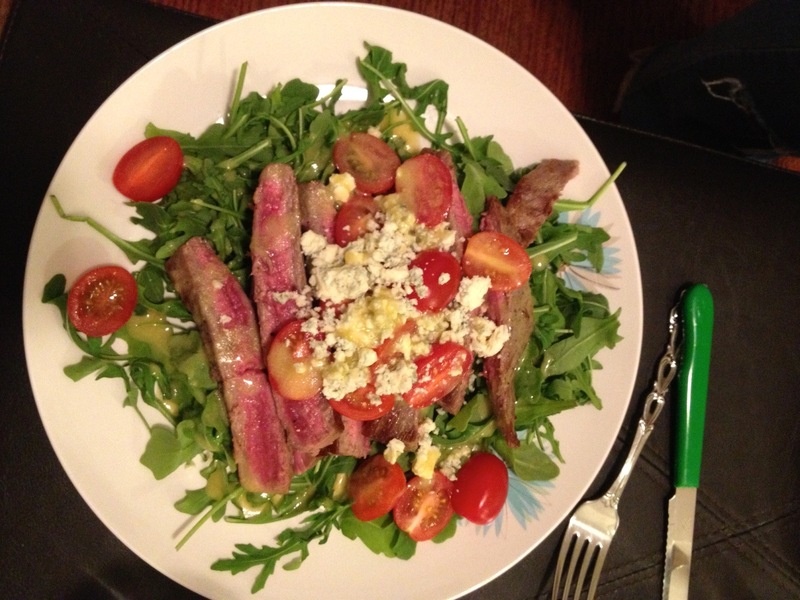 Plate the arugula and top with sliced steak, tomatoes, and blue cheese. 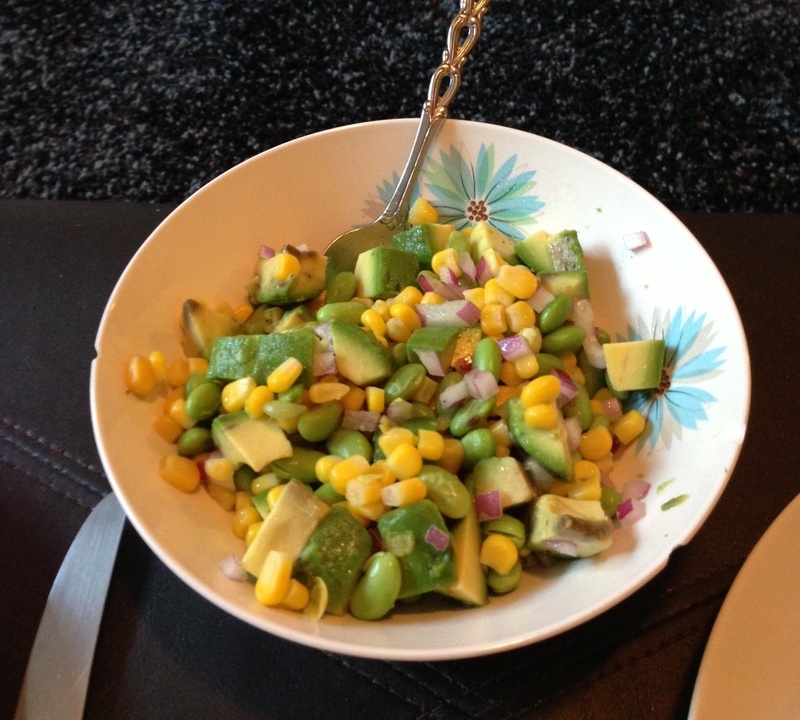 Whisk together all ingredients and pour over salad. I posted this picture on Instagram a couple weeks ago and was shocked at the huge response it got. I guess I shouldn’t have been, I was equally intrigued when I saw it on Pinterest. Which means alas, I cannot take credit for this genius idea. It’s so basic but so adorable and I find myself making it all the time as a late night snack. I can convince myself that because it’s mostly fruit, it must be healthy! Quarter the apple and cut out the core. Slice each quarter into 1/4 inch thick slices and fan out on a plate. Melt the peanut butter in the microwave for one minute until liquified. 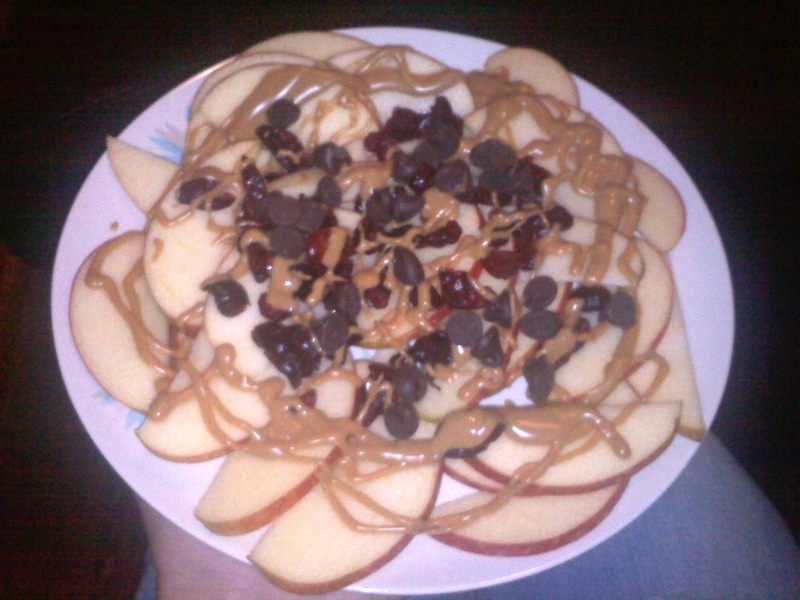 Sprinkle craisins and chocolate chips over the apple slices and then drizzle the peanut butter. Eat your face off.